Lake Marion is the largest lake in South Carolina (110,600 acres) and is centrally located within the coastal plain where it is bordered by Clarendon, Calhoun, Berkeley, Orangeburg, and Sumter counties. 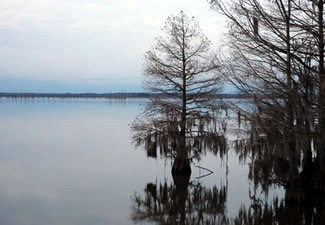 Lake Marion is the upper most of the two beautiful water bodies that comprise Santee Cooper Reservoir. Its head waters extend upstream nearly to the confluence of the Wateree and Congaree Rivers, where seasonally flooded, forested wetlands form the wildlife rich Sparkleberry Swamp. The reservoir was constructed to provide hydroelectric power to rural South Carolina and to provide needed jobs for a depression ravaged state. Because of World War II, the completion of the project was moved ahead and Lake Marion Dam was closed before the clearing of Lake Marion completed in November 1941. As a result, fishermen will find there are thousands upon thousands of stumps, dead tree trunks and live cypress trees. Much of this large woody debris serves as excellent fish habitat for nearly all fish species that inhabit the lake (especially crappie, bream, and catfish). Native aquatic vegetation is also present on the gently sloping shorelines and backwater sloughs, providing habitat for largemouth bass, pickerel, bream, and many other species. Navigational aids have been added throughout the lake to assist boaters; however, caution should be exercised when traveling on the waters of Lake Marion. The 6.5 mile long Diversion Canal connects lower Lake Marion to Lake Moultrie and provides a productive and weather protected area for anglers. The closure of Lake Marion Dam trapped a founding population of striped bass and a thriving population developed in the reservoir. Investigations of this population first demonstrated that striped bass could complete its life cycle entirely in freshwater. The striped bass fishery has declined in recent years due to a variety of factors, but recent steps taken to rebuild the population have had positive results. Blue catfish and flathead catfish were introduced into the system in the mid-1960s. They have readily adapted to the Santee Cooper lakes system and today provide many anglers with the opportunity to catch the largest freshwater fish they will ever encounter. Largemouth bass and shellcracker fisheries also draw anglers each spring, providing unique opportunities to catch large fish.